You may receive updates from GradNation, the sponsor of this form. Since 2007, the GradNation campaign has helped move our country toward the goal of a 90% on-time high school graduation rate by 2020. Sadly, while we’ve made notable progress increasing graduation rates, the population of students who experience periods of homelessness has also grown. 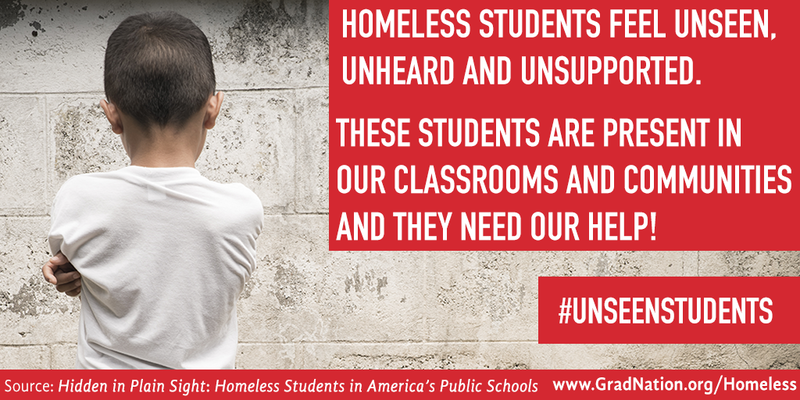 Today, 1.3 million public school students have been identified as homeless and that number is growing. Students experiencing homelessness are some of the least likely to graduate with their peers—a fact that will only change when schools are joined by the public and private sectors to take action. We can neither meet our graduation rate goals nor solve the crisis of homelessness without deliberately and fully addressing the needs of students who experience homelessness. In a recently released report - Hidden in Plain Sight: Homeless Students in America’s Public Schools -- we learned that homeless students felt unseen, unheard and unsupported. We must tackle the challenges of homeless students head on. Adults need to be aware that these students are present in our classrooms, programs and communities and they need our help. The undersigned individuals and organizations recognize the need for this community-wide response, and have pledged to create a web of support and take action that will help students experiencing homelessness cope and thrive. Join us as we work toward a 90 percent graduation rate for all students. Learn more at www.gradnation.org. Action Network is an open platform that empowers individuals and groups to organize for progressive causes. We encourage responsible activism, and do not support using the platform to take unlawful or other improper action. We do not control or endorse the conduct of users and make no representations of any kind about them. Full documentation and tutorial videos are available here. Send us an email with your name and your message at support@actionnetwork.org and we'll get back to you as soon as possible. Action Network partners get access to our full range of tools, including the ability to upload activists and subscribe them to your list, create custom-branded email and page wrappers, and more. Join organizations large and small who've made the switch!